The jackets have a drawstring through the hood which can pose a strangulation hazard to children. 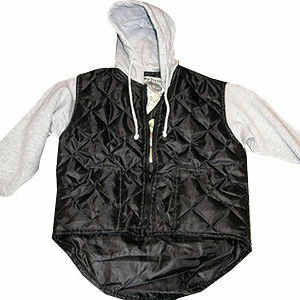 This recall involves about 1,300 children's jackets with a drawstring through the hood. They were sold in boy sizes 4, 5, 6, and 7 in color black/grey. The RN number 30842 printed in the center back neck and style number 1708 is printed on the hangtag on the center back neck. Burlington Coat Factory from September 2006 through April 2009 for about $17. Immediately remove the drawstrings from the jackets to eliminate the hazard, or return the garment to either the store or to Jason Evans Associates for a full refund. For more information, please contact Jason Evans Associates toll-free at (888) 683-0063 between 10 a.m. and 5 p.m. ET Monday through Thursday.